It is no surprise that people put cash into letters and greeting cards all the time, and send them through mail on a daily basis. While doing so is perfectly legal under United States law - and, in fact, there is no limit as to how much cash you can send through the United States Postal Service’s (USPS) mailing system—it just is not wise to do so. If you do chose to send cash via USPS, it is recommended that you use a certified mail service in order to track the item and require a signature upon delivery. Likewise, be sure to package it correctly so that the money can not be seen from outside of the envelope and so that the cash is protected while in transit. All that being said, it is against the law to send cash via USPS for an illegal purpose—like tax evasion, money laundering, or buying tickets for a foreign lottery. If you mail cash as part of a scheme that is fraudulent and are caught, you can be criminally prosecuted under our country’s federal mail fraud law. Penalties for mail fraud are stiff, as each offense has a potential 20-year prison sentence as well as a monetary fine of up to $250,000. If you or someone you know is shipping items across international borders, it is important to know that each country has a specific list of items that are not allowed to be sent via mail. The most common prohibited items across countries include illegal narcotics, hazardous substances, guns, and ammunition. There are some prohibited items, however, that may take you by surprise. Live animals are also prohibited from being sent via mail. Although it is true that sending money by mail is perfectly legal, it is probably not the best idea. This is because if your letter is damaged, stolen, or lost in transit, you have no way—and neither does the intended recipient - to recover the cash. Another safer way to send money to others includes using a cashier’s check or money order or even a wire transfer. 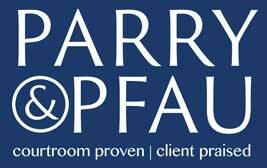 If you have any legal questions that need to be answered, contact the experienced Las Vegas attorneys at Parry & Pfau today.